Lucio Ranucci was born in 1925 in Italy. He began painting at the age of 22, shortly after his father past away. 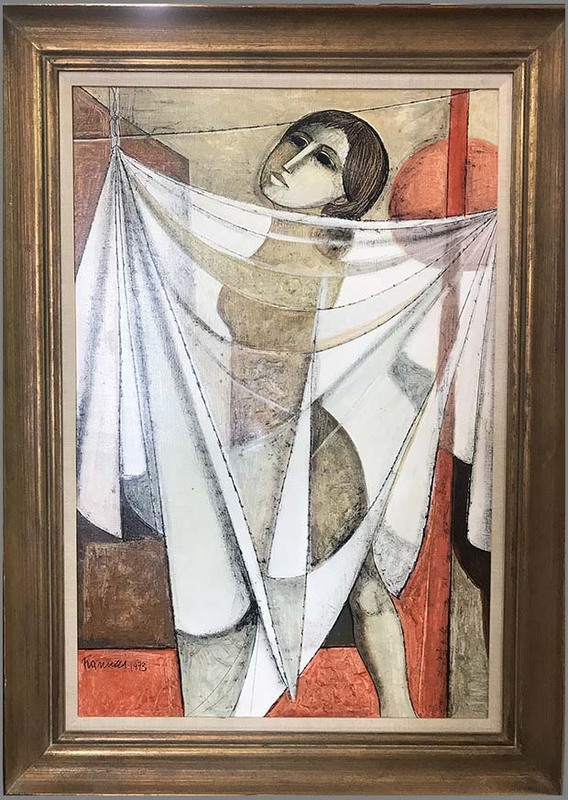 In 1947 Ranucci moved to South America, first to Argentina, and began his career as a painter in 1949 when he had his first personal show in Lima, Perù. This was then followed by some prestigious invitations, such as to the Bienal de Sao Paul in Brazil, in 1956, and the Bienal de Mexico, Ciudad de Mexico, in 1957, quickly afterward by others in numerous countries. What should have been a brief trip to South America lasted more than sixteen years. Apart from several occasional jobs (among them merchant sailor, photographer and hearse driver) Ranucci occupied himself professionally with journalism and theatre, especially in Ecuador, Columbia and Costa Rica. In the latter country Ranucci lived for over ten years and directed, among other things the University Theatre and an evening newspaper, which allowed him to be one of the first journalist to interview Fidel Castro and Che Guevara even before they entered Havana. In Costa Rica he painted a mural titled "Alegoria de la Secundo Republica" for the Juan Santamaria International Airport airport in 1953. Ranucci returned to Europe in 1963, settling in Saint-Paul de Vence, France where he continued to live and work. Lucio Ranucci, one of the exponents of the artistic current known as " realist cubism " was born in 1925 in Perledo (then in the province of Como, now Lecco). Both the father and the mother are doctors and therefore forced to move often for work, so Lucio and his sister Silvia spend their childhood in the various conduits between north and south Italy. In 1933, unfortunately, his father Bernardino died and his mother decides to move to Milan with her daughter, leaving Lucio in a college in Perugia, where the boy stays to study for eight years. At the beginning of 1943 Lucio Ranucci, like many of his eighteen-year-old peers, volunteered with the Italian military contingent for North Africa for what he imagines is a heroic adventure. The adventure lasted a few months, in May of the same year he was taken prisoner in Tunisia and returned to Italy in January 1945, as an interpreter for the Anglo-American troops. After the war, Lucio Ranucci joined his family in Milan where he worked as a journalist, but in 1947 driven by his desire for knowledge, he left for Argentina. Lucio Ranucci did not have many economic possibilities and, at the beginning of his stay in Latin America, to live, he is forced to accept occasional jobs: he is a sailor, a funeral driver, a photographer, moving to Chile, Bolivia and Peru, always keeping close to the cultural environment of the various countries, painting and taking an interest in local painting. Lucio Ranucci continued to be a journalist, painting his messages of denunciation of poverty, of the abuse and lack of freedom of the South American populations. Beginning is 1949, the year of his first solo exhibition at the Galleria Marini in Lima, Peru, he exhibited almost every year in Ecuador, Colombia, Nicaragua and, for the last forty years, in the United States, Italy and Europe. In 1950 Ranucci moved to Ecuador, where he put to good use his deep culture and passion for theater. He worked as a Director and Screenwriter for the Theater of the University of Quito, while he exhibited in Colombia and Jamaica. A member of the Murales school, Lucio Ranucci, like Diego Rivera , is convinced of the need to "cry out" social truth with painting, as Picasso did painting Guernica. "Painting - I will say in an interview in 1980 - I am particularly interested in its impact on social and political phenomena, certainly today we get more immediate results with cinema, in this sense, and with television, but think a little 'when the painter was really the only witness of his time, it was an exceptional fact, there was a graphic function of testimony "
The technique that Lucio Ranucci uses in his paintings is that of oil and acrylic, with the addition, sometimes, of sand and earth. 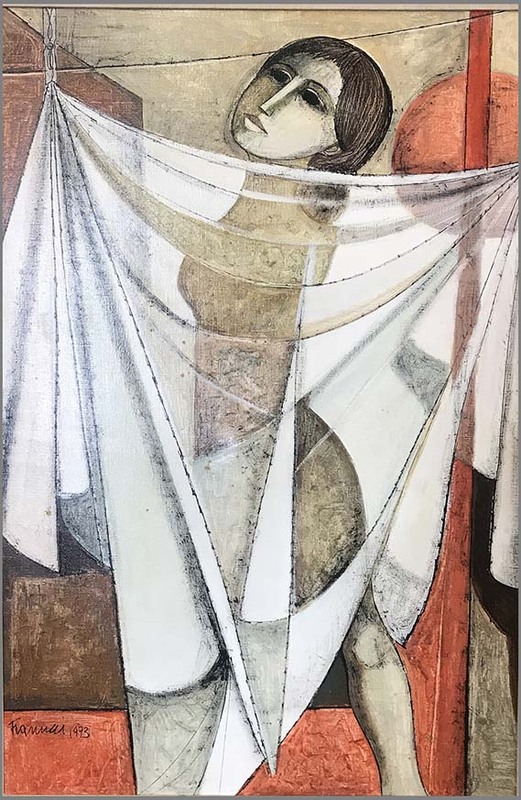 The human figures, Lucio Ranucci's favorite subjects, are static, often taken from the front, they look like wooden mannequins, but, paradoxically, those geometric and cubist shapes express a great spirituality and deep emotions.